alaTest zebrał i przeanalizował 1370 opinii użytkowników z magazynów i stron. Ludziom podoba się wydajność i przenośność. Rozmiar jest również bardzo dobra ale niektórzy mają wątpliwości co do pamięci. Eksperci oceniają ten produkt na 74/100 a użytkownicy na 88/100. Przeanalizowaliśmy te oceny, wiek produktu i inne czynniki, ale ilość ocenionych opinii dla tego produktu jest zbyt mała, aby obliczyć wiarygodne alaScore™. With long battery life, a sharp screen and some useful software features, the HD 6 offers impressive value for the money. It's an excellent choice for children, and anyone else looking for a small-screen tablet on a budget. Amazon's Fire HD 6 looks like the kind of tablet you'd give a kid for Christmas, and at $100, it's the best bargain you'll find. are now available for under £100, the tablet loses some of its shine at this price. The Amazon Fire HD 6 Kids Edition is best understood as a simple container for Amazon's FreeTime subscription kids' books and videos. One that's covered by a no-questions-asked two-year warranty. Two year, no-questions-asked warranty. Rugged case. Huge amount of subscription kids' content included, especially from Nickelodeon. Two-page book spreads are too small to be readable. Performance can be laggy. Very limited internal storage. Lacks Amazon's Mayday help feature. The Amazon Fire HD 6 starts at an affordable $99. Its small size makes it extremely portable and easy to use in one hand. Performance is smooth and its OS features a variety of family-friendly functions. The plastic construction feels cheap and girthy. It lacks Amazon's Mayday instant customer-service feature as well as the Google Play store. The free space on the 8GB model fills up quickly. 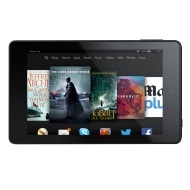 The smooth performing and feature-filled Amazon Fire HD 6 is unrivaled in the bargain tablet category. The Amazon Fire HD 6 is a well-built, reliable small-screen tablet for under $100, but it really suffers from a lack of storage. Solid. build quality. Bright, sharp screen. Good size for reading. Tons of Amazon streaming content. Very little internal storage, with no memory card slot. Sometimes laggy. Mediocre battery life. Lacks Mayday button for instant help. Soft audio; Just 8GB of storage; Poor camera quality ; The Fire HD 6 Kids Edition is an excellent kids' tablet that offers robust parental controls and gobs of free content in a durable design backed by a strong two-year warranty. The Fire HD 6 Kids Edition is an excellent kids' tablet that offers robust parental controls and gobs of free content in a durable design backed by a strong two-year warranty. Poor camera quality; Just 8GB of storage; Audio quality could be better ; Impressive parental controls and a very cheap price are not the only reasons to pick up the Fire HD 6. Impressive parental controls and a very cheap price are not the only reasons to pick up the Fire HD 6.